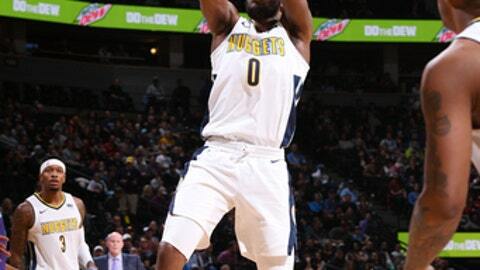 DALLAS (AP) Emmanuel Mudiay is headed to the New York Knicks, with Denver adding guard Devin Harris from Dallas on Thursday in a three-team deadline trade that the Nuggets hope will give them needed experience for a playoff push. The rebuilding Mavericks will get Doug McDermott from the Knicks, who are fading from postseason contention and just lost All-Star forward Kristaps Porzingis to a season-ending knee injury. Mudiay was the No. 7 pick in the 2015 draft and former starter, but hasn’t started a game this season and is averaging a career-worst 8.5 points in about 18 minutes per game. It was the second trade in as many days for the Knicks after Porzingis’ injury. They sent Willy Hernangomez, voted to the All-Rookie first team last season, to Charlotte for two second-round picks and forward Johnny O’Bryant, who was waived. Harris was having another solid season in his second stint with the Mavericks, who traded up to get him with the fifth pick in the 2004 draft. He returned to Dallas in 2013 after stops in New Jersey, Utah and Atlanta. The 34-year-old Harris averaged 8.5 points and 1.9 assists in a deep point guard rotation that included rookie Dennis Smith Jr., Yogi Ferrell and J.J. Barea. Nelson said the Mavericks were also getting a second-round pick, likely from Portland. McDermott, in the final year of his four-year rookie contract, will be a restricted free agent after the season. It’s the second time Dallas has traded Harris. The first was to get Jason Kidd from the Nets in 2008, three years before Kidd and Dirk Nowitzki led the Mavericks to their only championship. The trade came less than four months after Harris’ older brother, Bruce Harris, was killed in a car crash on a Dallas freeway. Harris said he thought there was a ”50-50” chance he would be part of a deadline deal. The Nuggets drafted Mudiay the same year they hired coach Mike Malone, but his role has diminished in each of three seasons for the former Dallas-area high school player who skipped college to spend part of a season in China. The Mavericks started the day tied with Atlanta for the worst record in the NBA. McDermott ended up in Chicago as the 11th overall pick in the 2014 draft. The Mavericks will be his fourth team in four seasons. He had come to New York from Oklahoma City in September in the Carmelo Anthony trade. The 2014 Associated Press college player of the year at Creighton, McDermott shot 43 percent from 3-point range in his second season with the Bulls but hasn’t been over 40 percent since then.